Candy is about 6 years old and her son Speights is about 5 years old. They were surrendered to CPL because their owner was unable to continue with their care. Candy and Speights have settled nicely here at the cattery and are blossoming into a friendly and cruisy twosome. Short haired Candy is the more outgoing while fluffy boy Speights is wary of getting underfoot. 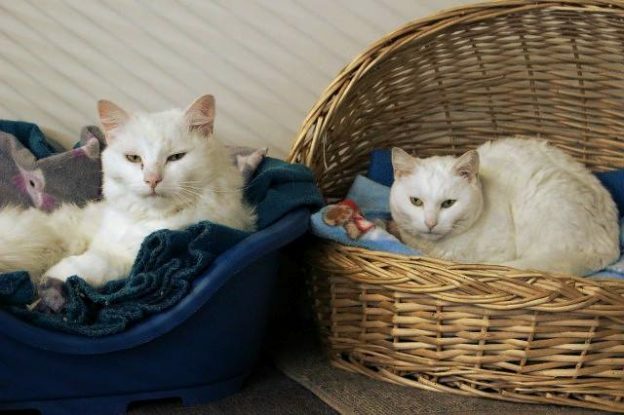 Candy and Speights are closely bonded and we would like them to be adopted as a pair. They have previously lived with a dog and may be happy to do so again (please note that we will ask to see how they respond to a particular dog before agreeing to an adoption). They will need sunscreen on their ears in the summer to protect from sun damage.